GEA has launched a new 8 in, adjustable-length, highly-versatile manure pump, which can be used in pits of varying depth. 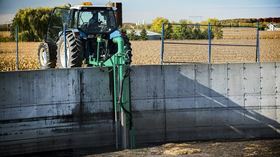 The Super Slider Pump has been specifically designed for use by dairy, hog and beef farmers with multiple pits and by contract manure haulers who travel from farm to farm. The pump is easy to manoeuver and is available in two depth ranges; 8 to 12 ft (2.44 to 3.66m) and 10 to 16 ft (3.05 to 4.88 m), making it ideal for operators working multiple pits. The sliding feature of the pump frame means that one pump can replace two or three other pumps, thereby reducing costs and increasing efficiency. Modern livestock barns often collect liquid manure underneath the area where the animals are housed (deep pit or slatted floor). The floor is often supported by several concreate pillars which can create a hazardous situation if they are hit by slurry at high pressure, causing harmful gases to be released into the air. To prevent such situation, both Super Slider Pump nozzles can be individually closed to enable slurry to be pumped safely from the pit as the liquid falls. Furthermore, GEA has equipped the Super Slider Pump with intuitive nozzle and rotative valve position indicators to enable the operator to monitor the direction of the discharge throughout the process - an important safety feature when collecting slurry from deep pits or slatted floor type of barns. The indicators are also used to make sure the nozzle is in the correct position when removing the equipment from a narrow pit opening to avoid damage. Suppliers of process technology for the food and beverage industry, GEA, recently showcased its new products for the beverage industry at BrauBeviale 2016.